Unauthorized Biography, c.1975 (details from the set of 56 photographs). Michael Druks – painter; sculptor; and conceptual, video, performance and installation artist – was born in Jerusalem in 1940, and has lived in London since 1972. Druks has exhibited internationally over the past four decades, including Documenta 6, Kassel (1977); Performance, Centre Georges Pompidou, Paris (1979); exhibitions at The Israel Museum, Jerusalem; The Tel Aviv Museum, Israel; and Cartographers, The Museum of Contemporary Art, Zagreb. Michael Druks: Travelling in Druksland, a major retrospective, was at the Museum of Art, Ein Harod (2007); and Druksland: An Audio-Visual Retrospective at Haifa Museum (2004). He was recently represented in Atlas Critique at the Parc Saint Leger Centre D’Art Contemporain, Paris (2012); and in Contemporary Cartographies: Drawing Thought, CaixaForum, Barcelona (2012), CaixaForum, Madrid (2013). Druks grew up in Tel Aviv where he studied at the Art Academy and became involved in avant-garde art and theatre circles. By the late 1960s, Druks was established as a leading young Israeli artist and decided to travel abroad. He arrived in Europe around 1970, and after a period in Holland, settled in England where he became known for his conceptual work, with solo exhibitions in the 1970s at the Museum of Modern Art, Oxford; The Whitechapel Gallery, London; De Appel, Amsterdam; and the ICA, London. In the mid 1970s, Druks made a major series of works involving varied interventions with TV screen images. 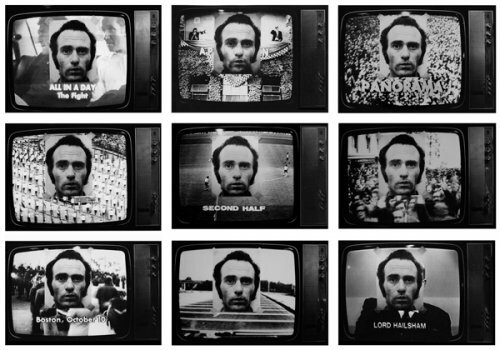 Using performance and photography, these interventions had subversive, humorous or politically charged results as is evidenced in Druks’s filmed performance work Playbox (1975) where he reacts and interacts with, programmes being broadcast on television; and in his photographic installation Unauthorized Biography (c1975). Druks’s conceptual map – the print Druksland: Physical and Social (1974) – has become an iconic image in both Israeli and international art, featured in numerous exhibitions, books, magazines, exhibition catalogues and posters. This work evolved from his “geographical technique” with which he intended to provide a coded visual language of signs understood all over the world; and reflected Druks’s preoccupation in the 1970s, with borders and boundaries and their social and political implications. Since the early 1980s, Druks has concentrated primarily on painting, making works he says are “details detached from a context” that require time and active participation from the viewer. Described by Arturo Schwarz as ‘mindscapes’, these enigmatic paintings are intended to entice an investment of time and imagination in the process of contemplating and decoding them – Druks sees this time element as incorporating “an extra dimension to a two-dimensional product”, saying that “my elusive images create the space for playfulness and involve the viewer’s participation in an active and democratic role”. He creates fictions, making images that emerge from his subconscious, although “the trigger for the picture is not the subject for the work”. Michael Druks has taken part in group exhibitions at England & Co, including The Map Is Not the Territory series (2002, 2003, 2009); Beneath the Radar in 1970s London (2010); and Wandering Lines: From Automatic Drawing to Abstraction (2012). This first solo exhibition with the gallery features early conceptual works and video together with a group of recent paintings.